When thinking about doing laundry and how to least impact the environment, the main things we need to reduce are energy consumption and pollution. Follow these tips to get you on this path, as well as to protect the health of you and your family. 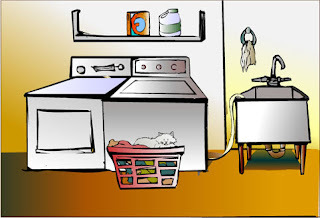 As far as energy is concerned, about 90% of the energy used for washing clothes is for heating the water. (Info from The Energy Efficiency and Renewable Energy office of the U.S. Department of Energy.) To reduce the amount of energy used for washing clothes—use less water and use cooler water. Unless you're dealing with oily stains, the warm or cold water setting on your machine will generally do a good job of cleaning your clothes. Switching the temperature setting from hot to warm can cut a load's energy use in half. • Wash your clothes in cold water using cold-water detergents whenever possible. • Wash and dry full loads. If washing a small load, use the appropriate water-level setting. • Dry towels and heavier cottons in a separate load from lighter-weight clothes. • Don't over-dry your clothes. If your machine has a moisture sensor, use it. • Use the cool-down cycle to allow the clothes to finish drying with the residual heat in the dryer. • Periodically inspect your dryer vent to ensure it is not blocked. This saves energy and may prevent fire. • Consider air-drying clothes on clothes lines or drying racks. • Look for the ENERGY STAR® and EnergyGuide labels. ENERGY STAR clothes washers clean clothes using 50% less energy than standard washers. Most full-sized ENERGY STAR washers use 18-25 gallons of water per load, compared to the 40 gallons used by a standard machine. ENERGY STAR models also spin the clothes better, resulting in less drying time. • When shopping for a new dryer, look for one with a moisture sensor that automatically shuts off the machine when your clothes are dry. This article is featured in A Carnival of Environmental Issues. Visit the carnival to read other great articles! Woo Hoo!!! It's time for the Ultimate Blog Party! Welcome to all you party-goers who are visiting my site for the first time - I'm glad to have you here. Please feel free to browse around. So, if you haven't registered for the Ultimate Blog Party yet, make sure you head over to 5 Minutes for Mom to do so and get in on all the fun and prizes! Thanks so much for leaving a comment, really appreciate it. Glad you like the photo. Great blog-love the hints and tips! I know I'll be able to use some of them. Thanks! Be sure to stop by Plucky Moms.. leave a comment, join our Mom Forum, and more! I'd also love to blogroll with you! Awesome tips for easter. Happy Easter!